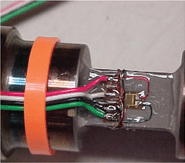 Load Sensors – HITEC Sensor Developments, Inc. These sensors are used in mechanical testing, ongoing system monitoring, and as components in devices such as industrial scales. The most common type of load sensor uses strain gauges for the sensor section, which are very small devices that measure the strain of an object by converting internal deformation into electrical signals to precisely measure weight, force, or strain. A strain gage is commonly a coil, although it can come in other shapes as well. A foil pattern is another common style of strain gauge. Force gauges use strain gauges in push-pull testing and flow measurements, utilizing these types of load sensors as part of a larger system rather then a simple circuit. While most measure and test with strain gauges, some are piezoelectric sensors, which use piezoelectric crystals to measure weight, strain, movement, and vibrations. After load sensors transduce mechanical stress into electrical energy, the information that they monitor is then signaled to a recorder or other computerized data collection system. Load sensors use analog or digital technology for the recording and transferring of information. Common analog outputs are analog current, analog voltage, and analog frequency, all of which are translated onto a screen as workable data. Load sensors and gauges are used in manufacturing, processing, and testing industries. The food processing industry uses them to precisely measure ingredients and for product distribution during packaging. Other applications include the testing of bridge building materials such as beams, for tension strength, as well as in railcar weighing, and truck scales. They are important components in calibration systems and are also used in fatigue testing for research and development laboratories. The automotive industry as well as construction, marine, and industrial manufacturing all utilize this vital tool. Load Sensors Load sensors are utilized in compression, tension, and shear force measurement instrumentation. They communicate to a computer system by converting the measured mechanical force into an electrical signal output.